A new study supports the theory that modern humans and Neanderthals had a common ancestor about 500,000 years ago. Research on a huge fossil collection from Spain supports the idea that our species, Homo sapiens, only started to become separate species from Homo neanderthalensis after about 500,000 years ago. 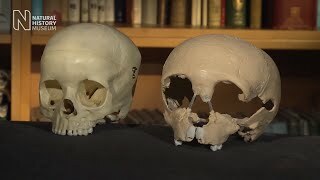 The new analysis of 17 skulls from Sima de los Huesos (meaning 'pit of the bones'), in Atapuerca, northern Spain, supports a 2012 study by Museum human origins expert Prof Chris Stringer. Previously, a Spanish team thought the 6,500 bones in the Sima de los Huesos cave belonged to a primitive human species called Homo heidelbergensis, with some Neanderthal traits. They were dated to around 600,000 years ago, far earlier than any other Neanderthal-like fossils. Using this evidence, the original conclusion was that H. heidelbergensis was an ancestor of Neanderthals only, and not modern humans. H. sapiens would therefore have had a different ancestor. ‘For a few palaeontologists, including me, this classification and dating have confused our ideas about where H. heidelbergensis sits in the human family tree,’ said Prof Stringer. Instead, he argued that the Sima bones were in fact early Neanderthals, and must have been from much later than 600,000 years ago. In this view, supported by other evidence from around Europe, H. heidelbergensis was an ancestor to both Neanderthals and humans, splitting into the two species after 500,000 years ago. The new paper by the Spanish team, published yesterday in Science, revises the age estimate of the Sima bones to around 430,000 years old. It also provides more detail on 17 of the skulls. By studying features such as the shape of the brow ridges and teeth, the authors were able to confirm that the fossils in fact belong to the Neanderthal lineage, and not to the species H. heidelbergensis. ‘This gives a much more substantial agreement between our views,’ said Prof Stringer. The thousands of bones at the Sima cave site come from at least 28 individuals. Prof Stringer thinks they still have a lot of secrets to give up. Explore Neanderthal facts, from looks to lifestyle and abilities. These early humans are far more similar to us than once believed.